Celebrating Independence – Time to look for a $US6 billion birthday present? 16 September 2017 marks PNG’s 42nd anniversary of Independence. How have things been going? A good benchmark for measuring progress is PNG’s Vision 2050 document. This sets out a blueprint for making PNG “a Smart, Wise, Happy and Fair Society by 2050”. The Vision’s primary measurement indicator is “We will be ranked in the top 50 in the United Nations Human Development Index by 2050”. So how is PNG going towards meeting this goal? 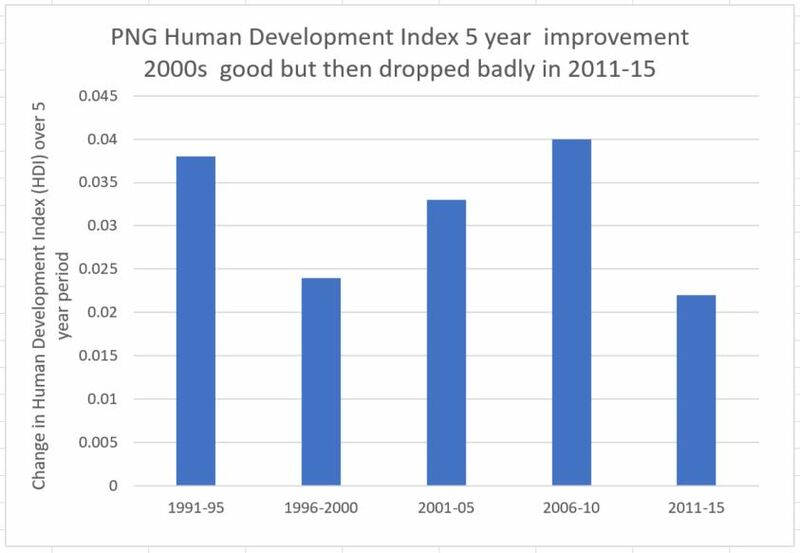 The following graph shows PNG’s progress in improving its Human Development Index (this is a composite index of factors such as life expectancy, education, and incomes). Since the 2050 Vision document was released in 2010, PNG had its lowest rate of improvement since 1990. 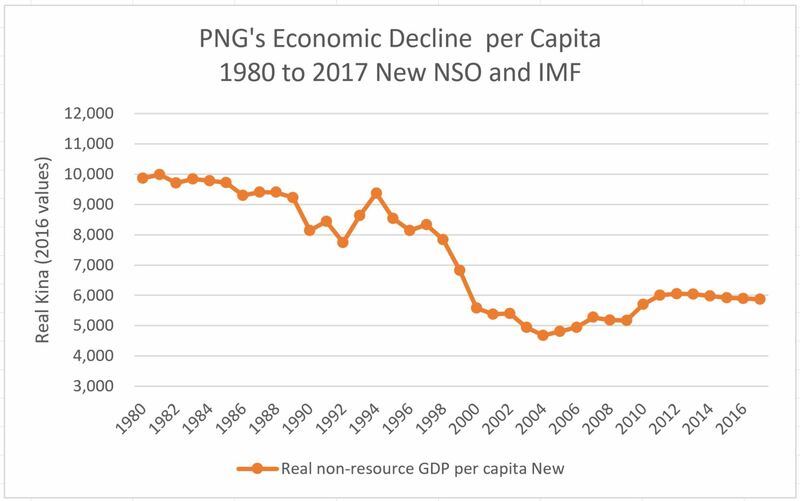 After doing well in the early 90s and during the 2000s, PNG has gone back to even worst rates of development than in the disastrous late 1990s. To meet the goal of being in the top 50, PNG needs to move from its 154th ranking of 188 countries in 2010 and jump forward by at least two places every year. So from 2011 to 2015, did PNG jump some 10 positions? No, it stayed exactly in 154th position by 2015 (the latest available data). Indeed, it is now in equal 154th position as Zimbabwe has moved forward and it now ranked exactly the same at PNG. PNG is in the bottom 20 per cent of countries and not moving forward. This is not good news. Vision 2050 also focuses on measuring changes in household disposable income – a good measure of economic progress according to Sarkozy/Stiglitz Commission. The best available proxy for this is tracking changes in real non-resource GDP per capita – see here and here. As shown in the graph below, this has actually fallen by over 40 per cent since 1980. Clearly, something is wrong. 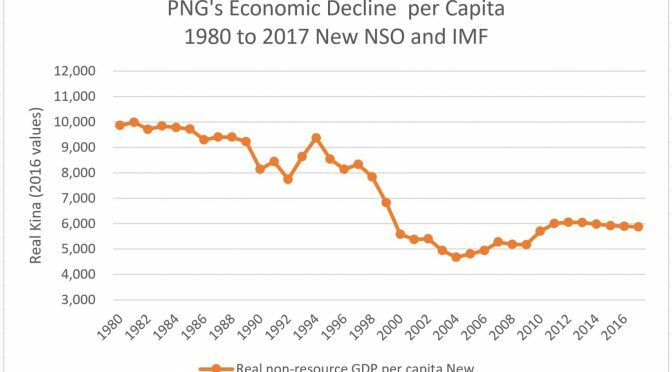 PNG’s development is going poorly relative to other countries and its own history, and has gone backwards very significantly in key indicators such as household incomes. There are some positive messages from the new government that they are looking for more inclusive growth. There is growing recognition that more work is needed in growing the agriculture sector and other non-resource sectors such as tourism. The resource sector needs to contribute more and PNG has to stop giving such significant tax, land and other concessions to big resource companies (including in the forestry sector). However, the new government has one hand tied behind its back because of the poor foreign exchange policies imposed by the BPNG Governor, Loi Bakani, which are killing imports, exports and foreign investment. The best hope at this stage, and it is my hope for PNG on this independence day, that PNG’s leaders reach out to the international community for help. Other countries such as Mongolia – see here – in very similar circumstances have been able to receive $US440 million in IMF funding and an estimated additional $US5.5 billion in additional cheap loan and grant assistance (much cheaper and transparent than Credit Suisse). A similar $US6 billion assistance package for PNG could become a vital bridge to help adjust the budget for the dramatic falls in revenues, to move away from central bank deficit financing, and to deal with the crushing foreign exchange shortages. The policy conditions around these packages are now very different from the more austere approaches of the late 1990s – the Asian Financial Crisis and the Global Financial Crisis have taught the IMF some lessons. Trying to do it alone will only cause much greater pain for the people of PNG. PNG should approach the international community at this time of economic and social difficulties for a $US6 billion birthday present. PNG has such tremendous potential and opportunities. It needs to tap more into its leading strengths in areas such as cultural diversity, bio-diversity and the extraordinary strengths of its people, including its women. May the next five years be better than the last five for true inclusive growth, and not just a big GDP number.